Congenital heart disease is present in over 75% of patients with Alagille syndrome. In fact, stenosis and/or hypoplasia of the branch pulmonary arteries, the most common cardiovascular abnormality, is one of the five elements used in the clinical diagnosis of this syndrome. Other commonly occurring lesions include tetralogy of Fallot, pulmonary valve stenosis or atresia, valvar or supravalvar aortic stenosis, and aortic coarctation. The peripheral vasculature is frequently affected as well. 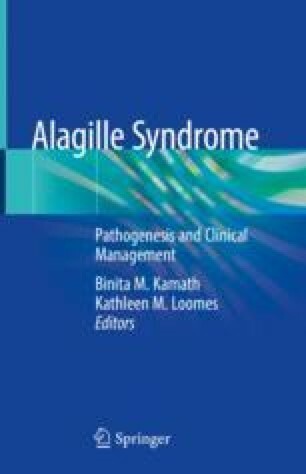 In this chapter, we discuss in detail the spectrum and incidence of congenital cardiovascular disease in patients with Alagille syndrome, as well as recommended diagnostic approaches and findings, surveillance, management, and outcomes.